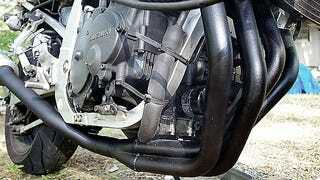 The exhaust on my sportbike was starting to look like crusty lines of crap left by a camel in the Simpson Desert. But I can’t afford new pipes, so I started looking for “preservation” solutions. That brought me to silica-ceramic coating header paint, so here’s everything you need to know about it. Why would I want to paint my exhaust? However it is a fair bit of work for a pretty trivial aesthetic modification, so for me it was about stopping that surface rust from turning the tubes into full-on swiss cheese. Or at least slowing it down. And while high-temperature paint ain’t cheap (like $8 for a spray can) it’s half a fraction of shipping costs alone on a new Yoshimura 4-to-1 exhaust system. Does the paint have any affect on performance? Pssssh, you’re talking to a guy who “fixed” a problem with a freaking aerosol product. You think I’ve got money for dyno time? If the paint does anything for performance it’s not noticeable, and on a 400 pound vehicle that makes 116 horsepower you can pretty much detect the drag of extra lint in your pocket. Interestingly, the color of your pipes does affect their heat emissions. Not out of the exit hole, but radiating from the pipe itself. Dark colors will expel more heat than light ones... which I didn’t actually believe until I lost a bet to my friend with an engineering degree. For a little more detail on the science there, start looking at an “emissivity table.” From a practical standpoint, a hotter pipe could be more likely to melt nearby hoses and plastics. But after making my GSXR’s pipe flat-black I can’t say the fairings look any more melty than they did before the job. Of course, I only ride the bike for one to three hours at a time and the body’s generally kept pretty cool by fast-flowing wind. You might want to consider this heat factor a little more carefully if your pipes are near more meltable bits. Inevitably someone will make the argument that “more emissive pipes allows exhaust gasses to be cooler, ergo denser, ergo moving out faster for more performance!” But I can’t believe any gain from this is worth discussing. What paint did you use and where did you get it? I used a paint brand called VHT (Very High Temperature) simply because it was what AutoZone had in stock, I shop at AutoZone because it’s the closest parts store to my house and I like the guys who work at my local franchise. Full disclosure: neither company has paid for or endorsed this post. The VHT stuff is called a “silica ceramic coating” rather than just “paint” because there are elements mixed in designed to reduce noise and heat emissions from the pipe. Allegedly. I’m a blogger not a chemist. If someone has the technology to do a proper experiment on that I’d love to hear from you. Otherwise, I’ll let you know if my fairings end up melting in a few months. Take even more care if you’re planning to paint a bike pipe because they get even hotter than some cars. And if you buy an underrated product, it might end up discoloring or burning off. To paint my bike’s pipes, which measure about four feet long and have a diameter of maybe three inches at max, I bought one can of primer and one can of matte black. Later I would end up using another can of matte to clean up a mistake. More on that later. Step 1: Park and mask. You’re not going bother pulling the pipes off your vehicle. Not just because you’re lazy, but because you don’t have access to a kiln that could superheat your exhaust pipes after they’ve been sprayed. I know you don’t have that because if you did, you wouldn’t be screwing around with aerosols. But don’t worry, you can “cure” your freshly-painted exhaust just by running your vehicle in specific intervals... more on that later. Point is, if you’re reading this you’re going to be doing a lot of masking. As soon as you park your pipes someplace well-ventilated yet sheltered from sun and rain. In the likely event you can only pick one, go for the ventilation. Decorating your dumb vehicle isn’t worth ruining your lungs. Then begins the long and laborious prep process. Anyone who’s ever painted anything (well) will know that prep is the most important part of the project. Paint is all about adhesion; the stuff’s gotta stick to the surface. And proper preparation makes your surface... more stickier. Good prep is also gonna be necessary to avoid getting paint anywhere you don’t want it. If you give half a crap about your project’s appearance, masking is almost more important than getting your intended item recolored. I went with a combination of trash bags and painter’s tape with mixed results. If you use big sheets of plastic, and you should because taping an entire car or motorcycle is gonna be the worst, be triple-careful that your masking is taut. One of the bags I’d used to cover the engine ended up getting blown in the wind right onto my wet-paint exhaust, ruining a visually obvious section, and forcing me to re-do. Many twigs were snapped in rage. Step 2: Sand and scrape. Ok so everything I don’t want painted is covered, am I ready to spray? No, LOL, you haven’t even started sanding yet. Depending on how rusty/nasty your exhaust pipe is, you’ll want to sand that sucker down with medium-fine to very fine sand paper. Whatever color the pipe was before you started, you want that thing to look like shiny bare metal and be super smooth before you start painting. Relax. Take your time. Getting metal to this finish is extremely satisfying. Some might even say... sensual. Like me. I say that. No judgements on the internet, right? Rub those pipes all up and down and make sure the surface is consistent. Won’t it be all...sandy and scrapey now? Yes, it’s going to look like you’ve just powersanded your grandma’s feet all over your pipes. You’ll have to remove all the rustdust and any other flakey residue, but avoid using water because water and freshly-sanded metal is a recipe for more rust. I like an oily rag wipedown followed by a few passes with a dry one ‘til the pipes are completely clean. I know you’ve got oily rags lying around in that filthy garage of yours. I know because I can never throw anything out either. What’s wrong with a lucky rag? Can I paint now please? Kinda; you get to prime! Which feels just like painting, so, get excited. First of all you’ve got to make sure conditions are right; you’ll want to wait until it’s between about 60ºF and 95ºF with less than 60% humidity before you start to spray... the can will have specifics for whichever brand you buy. Ignore at your own risk, but after spending hours masking every stupid little bolt and frame protrusion I’ve got a feeling you’re not gonna want to F it up at this point. Different paint brands do slight variations on the application process so read your can. Did I mention that already? You’re basically gonna want to do a light coat, wait ten minutes, another light coat, wait ten minutes, a medium coat, then wait half an hour before spraying your color. Wait! You shook the can first, right? Get that sucker cranking like you’re jacking off the Sasquatch. Shoot for a full minute of shaking after you start hearing the little mixing ball clattering around inside the can. Shake again for a few seconds after every minute of spraytime. Is there anything weird about spraying high-heat paint specifically? As a matter of fact there is, so pay attention. I already mentioned the humidity thing, that’s because the paint won’t stick properly if it’s too muggy. Then it’ll be all runny, and then it’ll look awful. Take the five seconds required to Google “[your town] current humidity” and you’ll thank me when your paint job doesn’t come out looking like an old man’s veiny leg. Paint application is just like priming; one light coat, wait ten minutes, another light coat, wait ten minutes, then a medium coat. When I say “light” I mean don’t even worry about big patches of primer still showing through. And when in doubt, err on the side of “lighter than you think” because this stuff starts running amazingly fast. In fact, I had pretty good luck doing a whole bunch of light coats rather than stepping up to a medium. Like, six to eight light coats before calling it a day and beginning the “curing” process. You do want to get every coat laid down within about an hour though, so don’t doddle too much. Why? Oh I’m just terrified of disobeying the can. All the paint’s on, you’ve given it half an hour to dry, and you’re peeling the masking off. Carefully, the last thing you want is some too-sticky piece of tape to curl up flaccidly and end up on your tender paint job only to scathe it. But do make sure you get all the tape... and then get ready to heat. Now, the VHT can says; idle 10 minutes, cool for 20. Idle 20 minutes, then cool for another 20. Go for a half-hour drive... and then you’re done. Don’t worry about the smoke. Definitely don’t breathe it though, pretty much smells like a burned leather book that a large animal just shat out. This process, according to the can, strengthens the paint against chemicals like oil and gasoline which will inevitably spill or leak from your crappy old engine. No way am I letting my air-cooled motorcycle idle for 20 minutes, it’ll overheat. So what do I do? Glad you asked, because obviously I had the same problem on my testbed; the 1991 Suzuki GSXR. To avoid catastrophic issues likely to arise from sitting static and getting really hot I did the 10 minute idle, then a little more idling, and finished the time-cycle laid out above “riding pretty slowly” instead of sitting parked. I might have planted a few bugs in the paintjob, but better that than getting stuck valves. Congratulations, your exhaust is painted! I’m guessing you screwed this up at some point. What mistakes did you learn from? Do not use a leaf to try and stop a paint run. You’re only going to make it worse. If you get runs you’re not happy with, your only hope is to wait for it to dry, sand it down, and spray again. Sorry. Go really light on those “light coats.” You can do as many as you need. Relax... it’s way harder to remove excess paint than add more. Be realistic about how precise you’re going to be. If there are a lot of wires and frame bits in the way, and there will be especially near the engine, you’re probably not going to get the pipe covered perfectly. This isn’t something you do on a Concourse bike. Don’t forget to re-secure and hoses you might have strapped out of the way during your masking process! Make notes of all the weird angles before you spray, and keep hopping around like an insect to make sure you didn’t miss a spot. If you can see it from a few feet away, it’s going to make you mad forever. How did it hold up on the road? One week and maybe 150 miles later, I re-sanded the rear half of the pipe because of where a piece of failed masking had ruined the paint. The rest looked fine. After re-masking and re-painting, I did a few light coats and was satisfied with the end result. Another few weeks and maybe another 100 miles later, everything’s looking dandy with the exception of a few stones that chipped the headers. Luckily, you can’t see ‘em with the fairing in place.